So i finally took the plunge and trekked up to scotland to bring the disco down to lancashire. I'm pleased to say it made the 200 miles without blowing up, and even seems to have returned about 16-17mpg (mostly motorway cruising at 60mph) which isnt too bad imo for a Carbed V8 on 235/85 BFG Mud Replicas. The problem with it is its completely gutless below 3krpm and even above that theres not much there. We drove most of the way down the motorway in 4th gear with the engine spinning >3krpm, because if we shifted into 5th it would just die given the slightest motorway incline even with the throttle nailed to the carpet. Once the engine revs were up over 3k it drove along happily enough, and although performance still couldnt be described as good, it was adequate. As has been discussed in previous threads about this motor, the dizzy has been replaced and is working correctly, and if anything its got "too much" advance due to having a RR EFI dizzy and running 7deg BTDC static. I've not heard anything that resembles pinking from it, even under full throttle 5th gear application on the motorway trying to get it to do something. Should i be looking at the Carbs? Which setting on the buckets should i be adjusting to try and correct this? Well the v8 certainly shouldnt be gutless at all- i can pull away *just* in 5th with not too much slipping of the clutch on my standard 3.5. Doesnt like it though! If your timing is correct, then have you checked the mixture? What colour are the plugs? Whats compression like? Nah at 30mph in 4th theres no response from the throttle at all. You hear the induction and exhaust note change and thats it. When it went thru the MOT the mixture was very high, so i wound the mixture screw on each carb half a turn in the "weak" direction and left it at that. Its always hard to get them to come out right though. Not sure on the compression ratio. I dont own a tester. Do your plugs look anything like the right hand one on this page? Think maybe you are a little too lean from your pics in comparison. But if its only a little lean then could that really cause it to be so lifeless? Make sure timing is bang on for a start.. Too much advance will affect performance at low revs. What carbs are fitted ? I'd also start looking at the engine condition. How many miles has it done? As you can see it pulls in the advance slightly faster than the original dizzy, then peaks at the same point. Wouldnt too much advance just cause it to pink a lot? The carbs are SU's of some description. I would like to get the motor on megasquirt eventually, however i dont fancy throwing money at it if the motor itself is dead. How will i know if the camshaft is worn out? Your description seems to suggest it would operate better at low revs if the cam was dead, but this motor operates much better above 3k than below. On a "normal" engine you can whip off a rocker cover and stick a dial test gauge on a rocker arm? Turn the engine over by hand and see how much lift you get on each cylinder. Does this work with hydraulic tappets? I think pot 7 is supposed to wear more than the other as the oiling it recieves is not so good. I dont have a dial test indicator, and they're not cheap tools either. So the Camshaft visible when the inlet is off? I guess if i found an EFI manifold and the bits to convert it, i could check the cam while the manifold was off. Still means spending out on parts for a possibly dead motor though. I baught this thing for some cheap fun and its not actually seen any offroading yet, probably should have waited for a TDi, but the V8 rumble drew me in! Correct needles in the carbs ? I'm almost-convinced that my poor performance at high revs is down to a mix of worn cam and wrong needles. But as it'll all be megasquirt and EFI soon, I don't care. The 3.9 I'm putting in had some really worn cam lobes, and I could see it pretty obviously with the manifold off. Worth a look ? Yep it is worth a look, but i cant see it telling the whole story. If the cam was worn and i'm now only getting say 5mm of lift instead of 6mm, then i'd expect the engine to be down in power across the board, which it is, but i'd expect it to suffer more at higher revs rather than at low RPM. Infact manufacturers often fit low lift cams and restrictive inlets to poverty spec shopping cars as it means they give good low down torque, something this engine doesnt have at all. I guess i could put it on a gas analyser and try and tweak the carbs up a bit, but then they're horrible old things, who knows what condition they are in. One part of me says i should try stripping them down and cleaning them up, re-oiling/greasing what ever black magic makes them work, another part says divert yet more money away from the 90 and get the bits for a megasquirt conversion. For what it's worth, couple of the end-lobes on mine looked like they had practically zero lift - the cam profile was more "round" than anything else...... it was near impossible to see where the actual lobe began and ended on the worse ones. Might be surprising just how bad it is. Also, my (current) 3.5 with twin SUs sounds like it's in roughly the same boat. Zero power on-road, pulls from nothing off-road though (low TB masks the deficit). Get it on-road, up to 3rd and it starts going backward. Fifth is a waste of time unless downhill. Am hoping for a serious transformation when the 3.9./efi goes in..
Also, my engine was (by design) a low compression model, 8.25:1 if I remember. The guy who checked it out told me it was never going to be a screamer, because of that. You'll get the compression ratio from the number stamped on the side. Its an 8.25:1 motor afaik. Dont have the engine number to hand but seem to recall looking it up before. So assuming worst case the camshaft is broomhandle shaped, whats involved in changing it? Can i find a cam from a 3.9 and jam it in? Will this give me more performance than just using another 3.5 Cam? If you order all the parts from Real Steel where possible, 01895 440505. Timing chain set, AZ770, qty 1. Hydraulic lifter set, AZ794-16, qty 1 set of 16. Inlet manifold gasket, CX7590, qty 1. Valley end seals, CX2684, qty 2. Timing cover gasket, CX2144, qty 1. Rocker cover gaskets, CX2454, qty 2. Front crank oil seal, CX2184, qty 1. Camlube additive, BY159, qty 1. Rimmer Brothers - http://www.rimmerbros.co.uk/Item--i-ERR5924P order online. Worth replacing the timing chain while you have it all out, and the camlube is an essential apparently. Just found what looks like an official LR V8 overhaul manual. Looking at the list you posted theres about £100 worth of parts over an above the cam itself, with the biggest part of that being the lifters. Do the lifters need replaced? I guess the cam runs directly on the base of it, so it wears with the cam? Can they be refaced or is it just not worth the risk? What about the timing chain? Is it a case of its a nice to have or is it a must while its all in bits? Looks like its going to cost me about £150 to change the cam, plus stuff like antifreeze. The other issue is if i do the cam at the same time as switching to EFI, i'm risking damaging the new cam by not bedding it in properly, so i'd likely have to refit the SU's to bed the cam in, before stripping the inlet off again to fit the EFI system. All gets a bit spendy when theres no sure way to know that is the problem! Perhaps i could start by getting a new inlet gasket and just pop the manifold and take a peek at the camshaft? Geh so much for cheap projects eh?! Start with a thorough looksie to check everything is setup as per book, strip and reassemble the carbs and go from there, delving into the guts of an engine cos you have no power is a bit reactionary IMHO. As far as the lifters go, YES, you need to replace them, and on first starting you need to follow the bedding in procedure TO THE LETTER, otherwise you will scrap the cam and lifters within a few thousand miles (if not less). 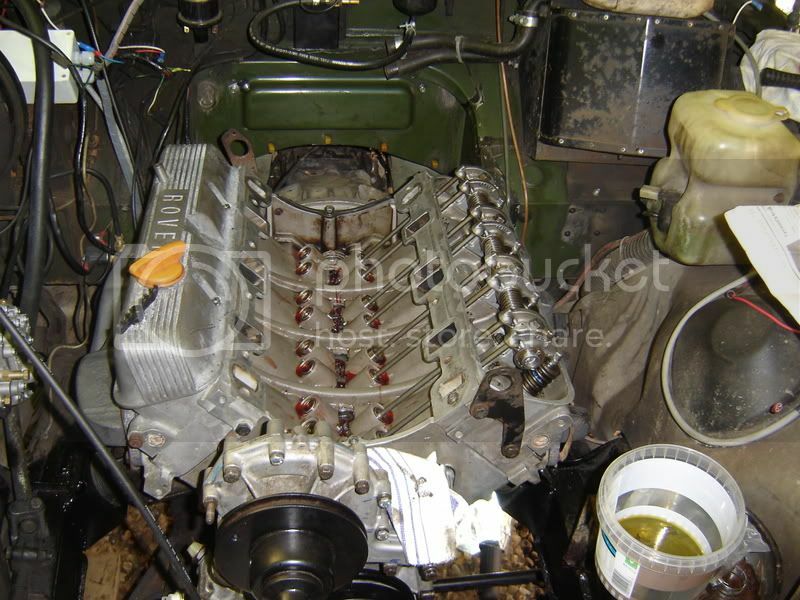 The inlet manifold gasket is pence - it will only be your time to pull it off and check. Ye i've heard of cam bedding in from previous engines. My vauxhall one required something like 10 minutes at 2000rpm followed by 5 at 1500rpm. My point being that if i DID intend on changing the carbs, i'd really have to refit the SU's to do the bedding in, rather than trying to get a new megasquirt install working and the cam bedded in at the same time! Perhaps stripping/cleaning the carbs is the way to go. Might have a look at that later in the week when i've got some free time. Unfortunately, being a "young un" i'm much more at home with wires, sensors and electronic engine management than a pair of clanky old SU's, so while wiring my Audi V8's original engine management up inside a landrover doesnt particularly worry me, messing with tiny bits of carb guts does! Engine swap screws up the insurance though, so i'd rather keep the original motor if at all possible. I just checked the V5 and it states the engine number is "27G...". I thaught this was an 8.13:1 motor, but i can only find mention of a 27D and 27A online i cant be sure. I've not checked the actual motor to see if it matches the V5 right enough. Autodata only lists 3 3.5 motors for a Disco, two EFI models named "22D" and a carb model, which is presumably what i have. The carb model is listed as 144hp at 5000rpm. Not going to set the world alight, but should be enough to propel it along at a reasonable pace, and certainly should be quicker than a TDI! TBH i want to spend as little as possible on the motor. I dont mind spending the money on 'squirt, as its an investment and something that can be moved onto different projects, plus its a nice learning curve, but sinking money into a rusty 1989 Disco with a V8 is defo not part of the plan! If its cheap and will make a worthwhile improvement then i'm all for it.